fruit . root . leaf . : Urban...what!? A donkey and goat in the heart of Vieux-Quebec! Urban...what!? 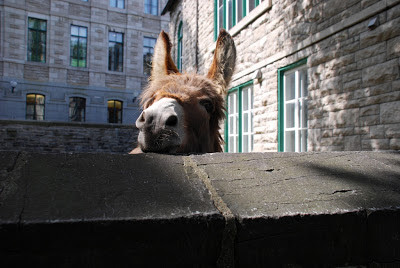 A donkey and goat in the heart of Vieux-Quebec! Meet Aldo. He's an urban donkey, at least half of every year. He winters in the Bishop's garden at the Anglican Cathedral of the Holy Trinity. Along with his companion goat, Alli, Aldo has made quite a splash in this historic district. Just a few feet from the Château Frontenac, these two gregarious critters have made friends out of nearly every neighbor, along with the regular cathedral visitors. They have also inspired a fledgling 'green' ministry at the cathedral, and I've been swept along on the tide. In June, I met the woman responsible for installing Aldo and Alli at the cathedral, and she told me their story. It is the stuff of fairy tales. The results were this QCT article and many photos archived in our gallery. A week later, the animals moved to their summer quarters in the countryside, and I thought that was the end of it. Then, less than a month ago, I was contacted for permission to reproduce one of my photos. Aldo was going to be in print! The vision was a calendar featuring Aldo, Alli, and their friends. 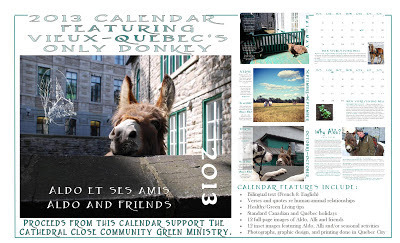 Sales of the calendar are meant to be an initial fundraiser for the new Cathedral Close Community Green Ministry. Well, mountains were made out of molehills, and in the end, I collaborated with Aldo's mother and host mother (the bishop's wife) to create a fabulous calendar. Along with numerous humorous and picturesque images of the main characters, the calendars also offer bilingual quotes/verses and green living tips. Click here to see the samples. Click here to hear the CBC coverage of Aldo and Alli during the first of two holiday caroling services held outside the cathedral. The second service took place at noon on Wednesday, December 20, and the QCT covered the event. Calendars are available for purchase right now! 100% of proceeds support the Cathedral Close Community Green Ministry. You can purchase a calendar at the cathedral, or feel free to contact me at fruit.root.leaf@gmail.com if you would like to place an order. They will make great stocking stuffers, New Years gifts, and will bring a quirky bit of old Quebec City right into your home. Hop, hop, though - they're going fast!